Get out your box of tissues because you are definitely going to need it for this book. I was blown away by how good this book was and how it truly wound its way around my heart. This book has three main characters in it…..Dane, Seth, and Truman. Dane is an English teacher who is married with two children. Dane is not comfortable in his own skin. See he has a secret. He has lied to himself for so long that when his wife passes away unexpectedly he finally admits to himself the secret he has kept from everyone including himself….he is gay. Through your this book I was actually able to feel the emotions that Dane was going through as he admitted to himself and then later on to his family and then the school that he is gay. I could feel the heartache he felt and then the acceptance from himself and his family and the relief to finally be the man he was supposed to be all along. Then there is Seth. Seth moved to twin to be the new English/ theatre teacher. I believe that Seth is an out in the open gay man that in my opinion brought Dane out of his shell. He is comfortable in his own skin and even though he has some negative things happen in his life, he has not let that get him down. To me, Seth is a good example for Dane and he supports him which is what he needs. Finally, last but not least, Truman. He is my favorite in the whole book and by far the most inspirational of all of them. Truman is a 16 year boy that is just starting high school. He is different from the other students from the way he looks to the way he dresses. He is gay and does not try to hide that fact but he is also terribly bullied by just about every student in the school. Truman broke my heart more then once through out the book and I found myself wanting to cry for him and wanting to wrap him in my arms and tell him that it does not matter what other people think of him. That he would grow up to be someone wonderful and all the bad stuff would be behind him. This book really hit me in the heart and I am sure that I will not be able to forget it any time soon. This is one of those books you remember years to come. I highly recommend this book to everyone. Congrats to Rick R Reed. You def did an awesome job on this book. Def worth being proud of. 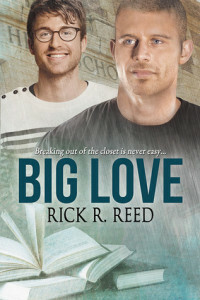 With a title like Big Love and a synopsis that mentions a relationship between two men who are teachers at the high school and a high school age guy I wasn’t sure what to think but rest assured this is a heart warming story and not a whiff of anything seemingly inappropriate. Some Spoilers ahead. At the start of the story we are introduced to Dane a High school English teacher who is a deeply closeted man with a wife and kids. And Truman an effeminate and “out” freshman at the high school Dane teaches at. Needles to say the first day doesn’t go so well for either of them as Truman is ridiculed for being different and gay. While Dane’s life is changed forever when he loses his wife. You can’t help but want to hug both of them to soothe the pain they each try to deal with over the coming months when in walks Seth. At a turning point in his life as well, he comes into Dane and Truman’s lives when things seems the most hopeless. Seth is a balm to each of their souls when they are struggling with how to overcome the pain of loss and resentment. Seth is the steady force of the story offering guidance to each of the two guys. Truman is a troubled teenager at the most vulnerable and unsteady. Dane is still trying to come to grips with being an openly gay man. As Seth helps Truman he also helps Dane. It just goes to show that at any age we sometimes need help accepting who we are and learning to own it. They each play very different roles through the rest of the story. Truman the troubled grows into how he really sees himself. This helps Dane who is the compassionate one of the three accept who is he and who he wants. Meanwhile Seth is the supportive one who ties the three together in friendship. And later in love between Seth and Dane. If you are new to the M/M genre and are looking to get your feet wet this is a good book to start with.This story really allows you to get a glimpse from three different perspectives of gay men. Three very real life scenarios that this book did really well without being overly dramatic and keeping it very real. The author alludes to the intimate relationships without much graphic detail. If you are interested in reading M/M and aren’t really sure, this is the book I would recommend to give it a try. What an absolutely beautiful book. Right from the first page, I was hooked. I loved everything about this story. Many of the touchpoints in the novel–death and grief, coming out, bullying, new love–are familiar themes. But the way the threads of these characters’ lives intersect are fresh. In this book, it’s not so much the big picture as the small details which kept me turning pages. It would be hard to pick a favorite character. What I loved was these three very different people finding each other and finding themselves. They’re on three completely different paths when we first meet them, but life throws them together. I found myself relating most to Dane’s experiences of being true to himself later in his life. His story should feel familiar to anyone who has spent a lifetime suppressing important parts of themselves. My favorite moment is when he realizes that even Truman is farther along in his self-discovery than Dane is. Such an honest, real moment. Seth, fresh from a breakup and licking his wounds, is a delightful and refreshing character. He lightens the tension of the much more serious issues the others are facing. Without him, or if his story had been equally tragic, the novel would have felt bogged down in sadness and pain. Instead, we have Seth’s warm openness to draw out the best of the other two. My favorite moment is when he shows the courage to do what’s best for himself even when tempted to do what he shouldn’t. Truman is simply wonderful. His pain at the beginning had me in tears, and I was afraid that at some point, his story would have an unhappy ending. Instead, we get to see the butterfly in him emerge. My favorite moment with him is when he says it doesn’t matter if he’s like a girl because there’s nothing wrong with girls. I actually cheered out loud. I did notice the ongoing use of the word “sissy” and wondered why the author chose it. It’s not a word I hear kids use too often these days, but it might be a matter of local culture regarding which words are flung at kids who don’t conform. It didn’t affect my enjoyment at all, merely made me curious. This is not a traditional love story. There’s a romance between Dane and Seth, yes, but it isn’t the focus. The whole story is centered on the characters’ growth and ownership of who they are. It’s gentle and sensitive and absolutely wonderful. Even the fairly non-explicit intimacy fits seamlessly into the narrative. Although there are many aspects of a sensitive nature (coming out late, death of a spouse, attempted suicide, bullying, hints of disordered eating), these are all handled with so much grace. Though the main characters are all gay, I believe this is a novel everyone should read. Absolutely beautiful.